While most teas, by and large, are best consumed soon after production to retain both their aroma and flavor, Pu-erh can be aged and refined like wine. It undergoes a fermentation process (either naturally or artificially) where microbes act on the tea leaves over time, causing the leaves to darken and the flavor to change to become smoother and more complex. Depending on the conditions and the environment of aging, the taste can transform through various stages, from being fruity, floral, grassy, to being earthy, woody and nutty. 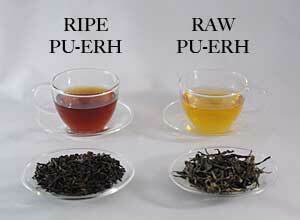 There are two major types of Pu-erh tea: "Raw Pu-erh" and "Ripe Pu-erh". These two Pu-erh types are distinguished by their respective fermentation processes. Both types of Pu-erh are made from the same raw materials (mao cha) - freshly harvested leaves that have been wilted, either fried manually or tumbled through a heated rotating cylinder, kneaded and sun dried in open air. The term "Raw Pu-erh" refers to loose leaves, tea cakes or bricks made from raw materials without additional processing. Raw Pu-erh can be consumed immediately to enjoy its fresh, floral or fruity flavors, or it can be left to age in a natural environment to achieve a mellower, smoother and more complex flavor. Naturally aged Raw Pu-erh teas, particularly those made from premium raw materials, are the most sought-after by tea connoisseurs. "Ripe Pu-erh" offers an alternative to having to wait ten to thirty years for the Raw Pu-erh to mature and achieve the aged flavor that is popular among many Chinese. In the 1970's, the industry developed a method to artificially accelerate the aging process by "cooking" Pu-erh tea. This "cooking" process, called "wo dui", involves incubating the tea in a moisture-rich environment where microbial activity causes the temperature to rise, drastically intensifying the fermentation process. This process typically takes a few months to complete. Raw: Young raw Pu-erh shares similar characteristics as green tea. As the tea ages, it becomes more complex and is famous for its stronger mouth sensation and long-lasting aftertaste. Ripe: Earthy and mellow. Aged ripe Pu-erh becomes smoother and the earthy flavor transforms into sweet plum flavor. Ripe: Dark chestnut Appearance of the leaves: Raw: The brewed leaves of raw Pu-erh are more intact, plump and soft. Ripe: The brewed leaves of ripe Pu-erh are generally broken, black in color and no longer soft. Whether fermented naturally or manually, studies have shown that the microbial activity in Pu-erh tea offers probiotic health benefits that no other teas offer.